Astragalus propinquus Schischkin var. glabra Vydr. Astragalus propinquus (syn. Astragalus membranaceus, commonly known as Mongolian milkvetch in English and as huáng qí (Chinese: 黃芪), běi qí (Chinese: 北芪) or huáng huā huáng qí (Chinese: 黃花黃耆), in Chinese, is a flowering plant in the family Fabaceae. It is one of the 50 fundamental herbs used in traditional Chinese medicine. It is a perennial plant and it is not listed as being threatened. A. propinquus is used in traditional Chinese medicine (TCM). A. propinquus is an component in Lectranal, a food supplement used in treatment of seasonal allergic rhinitis, though there is limited evidence of its effectiveness. Chemical constituents of the roots (Radix Astragali) include polysaccharides and triterpenoids (such as astragalosides), as well as isoflavones (including kumatakenin, calycosin, and formononetin) and their glycosides and malonates. An extract of A. propinquus called TA-65 may activate telomerase, extending the lengths of the shortest telomeres which protect the terminal DNA at the ends of all chromosomes. It contains the saponin cycloastragenol. 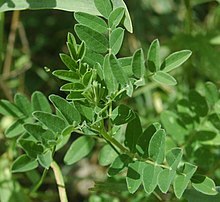 While several other species of Astragalus are known to cause severe poisonings in livestock due to indolizine alkaloids, aliphatic nitro compounds, and accumulated selenium, none of these constituents have been detected in Astragalus propinquus used in dietary supplements and TCM preparations. ^ a b c "Astragalus propinquus Schischkin". LegumeWeb. International Legume Database & Information Service. 2005-11-01. Retrieved 2012-02-27. ^ English Names for Korean Native Plants (PDF). Pocheon: Korea National Arboretum. 2015. p. 368. ISBN 978-89-97450-98-5. Archived from the original (PDF) on 25 May 2017. Retrieved 26 January 2017 – via Korea Forest Service. ^ Joe Hing Kwok Chu. "Huang qi". Complementary and Alternative Healing University. Retrieved 2012-02-27. ^ "Astragalus membranaceus – Moench". Plants for a Future. ^ Block, Keith I.; Mead, Mark N. (1 September 2003). "Immune System Effects of Echinacea, Ginseng, and Astragalus: A Review". Integrative Cancer Therapies. 2 (3): 247–267. doi:10.1177/1534735403256419. PMID 15035888. ^ Guo, Ruoling; Pittler, Max H.; Ernst, Edzard (December 2007). "Herbal medicines for the treatment of allergic rhinitis: a systematic review". Annals of Allergy, Asthma & Immunology. 99 (6): 483–495. doi:10.1016/S1081-1206(10)60375-4. PMID 18219828. ^ Xu, Q.; Ma, X.; Liang, X. (2007). "Determination of Astragalosides in the Roots of Astragalus spp. Using Liquid Chromatography Tandem Atmospheric Pressure Chemical Ionization Mass Spectrometry". Phytochemical Analysis. 18 (5): 419–427. doi:10.1002/pca.997. PMID 17624885. ^ Lin, L. Z.; He, X. G.; Lindenmaier, M.; Nolan, G.; Yang, J.; Cleary, M.; Qiu, S. X.; Cordell, G. A. (2000). "Liquid Chromatography-Electrospray Ionization Mass Spectrometry Study of the Flavonoids of the Roots of Astragalus mongholicus and A. membranaceus". Journal of Chromatography A. 876 (1–2): 87–95. doi:10.1016/S0021-9673(00)00149-7. PMID 10823504. ^ Harley, C. B.; Liu, W.; Blasco, M.; Vera, E.; Andrews, W. H.; Briggs, L. A.; Raffaele, J. M. (2011). "A Natural Product Telomerase Activator As Part of a Health Maintenance Program". Rejuvenation Research. 14 (1): 45–56. doi:10.1089/rej.2010.1085. PMC 3045570. PMID 20822369. ^ Rios, J. L.; Waterman, P. G. (1997). "A review of the pharmacology and toxicology of Astragalus". Phytotherapy Research. 11 (6): 411–418. doi:10.1002/(SICI)1099-1573(199709)11:6<411::AID-PTR132>3.0.CO;2-6. ^ Japanese Pharmacopoeia (PDF) (15th ed.). Archived from the original (PDF) on 2011-07-22. "Astragalus membranaceus – Moench". Plants for a Future. "Astragalus membranaceus (FISCH. EX LINK) BUNGE – Fabaceae". Dr. Duke's Phytochemical and Ethnobotanical Databases. ARS / GRIN. Archived from the original on 2004-11-15. This page was last edited on 6 January 2019, at 01:39 (UTC).